The Tactical Secure Voice Cryptographic Interoperability Specification (TSVCIS) is variable data rate system that is based on a MELPe STANAG-4591, and offers also scalability to enhanced coding at higher rates such as at 8000, 12000 and 16000 bit/s. 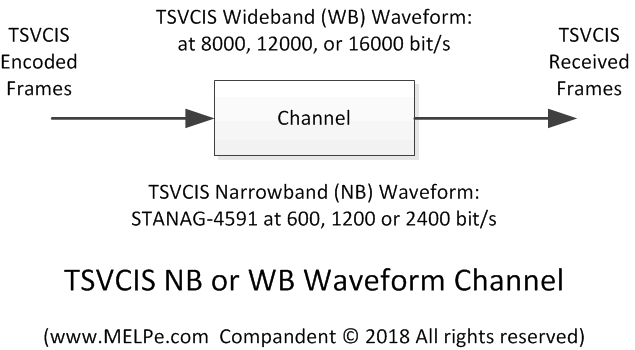 TSVCIS Wideband (WB) Waveform which operates at 8000, 12000, and 16000 bit/s and is based on both the STANAG-4591 codec and additional encoded voice wideband parameters that enable scalability of the 2400 bit/s MELPe to higher multi-rate speech coding. The TSVCIS VDR encoder is illustrated below. Using the input speech and the selected mode, the STANAG-4591 MELPe vocoder can be used along with the NRL Variable Data Rate (VDR) encoder to encode Wideband Waveforms frames at rates 8000, 12000, and 16000 bit/s. Based on the selected TSVCIS VDR operation mode and input speech frames input from the MELPe encoder, the VDR encoder generates and encodes residual spectral codes parameters into additional bits that, along with the standard 2400 bit/s STANAG-4591 bits, are used to generate the Wideband Waveform frames at 8000, 12000, and 16000 bit/s. The TSVCIS VDR decoder is illustrated below. It extracts STANAG-4591 and VDR frames, and input them to STANAG-4591 decoder and VDR decoder, respectively. The STANAG-4591 MELPe decoder synthesizes its output speech, which is then input to the VDR decoder. The VDR decoder decodes its residual signal which is then used, along with the MELPe output, to synthesize the TSVCIS VDR output speech. The TSVCIS VDR encoder, is used as part of the TSVCIS encoder as illustrated below. The TSVCIS encoder encrypts the VDR encoded frames, and subsequently performs Forwarded Error Correction (FEC) coding using BCH codes. The TSVCIS VDR decoder, is used as part of the TSVCIS decoder as illustrated below. The TSVCIS decoder performs Forwarded Error Correction (FEC) decoding , and subsequently decrypts the frames to generate the received VDR encoded frames, which are them input to the TSVCIS VDR decoder to generate the output speech. The TSVCIS NB and WB channels are illustrated below, where the NB uses the standard STANAG-4591 MELPe, and the WB uses the STANAG-4591 along with the VDR to transmit 8000, 12000, and 16000 bit/s waveforms. 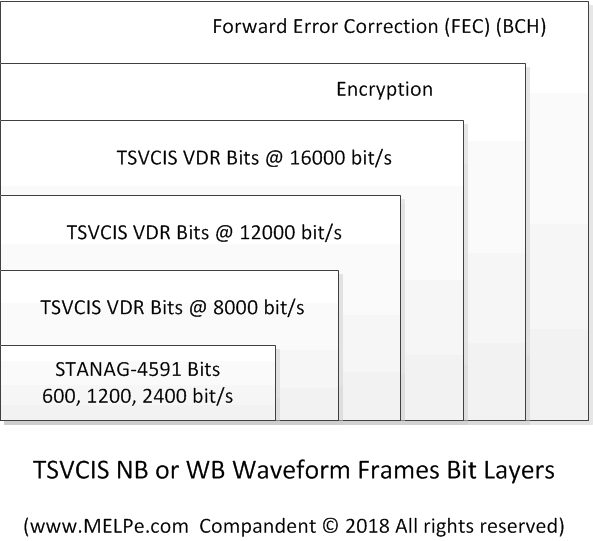 The TSVCIS NB and WB Waveforms' bit layers are illustrated below, where the NB uses the standard STANAG-4591 MELPe, and the WB uses the STANAG-4591 along with the VDR, encryption, and FEC, to transmit 8000, 12000, and 16000 bit/s waveforms. Compandent's STANAG-4591 MELPe suits can be used along with the VDR coder to generate the TSVCIS vocoder. Alternatively Compandent's FLEXI-232 DTE may be used along with some additional processing to form a TSVCIS vocoder, as illustrated below. Similarly, when modem is used, Compandent's FLEXI-232 DTE may be used along with some additional processing to form a TSVCIS vocoder, as illustrated below.